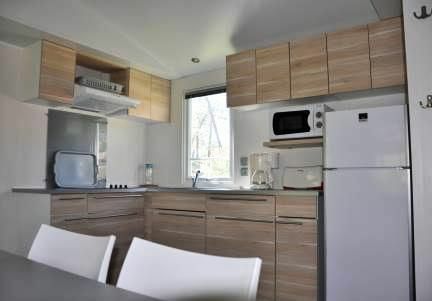 33m ², kitchen, 3 bedrooms, bathroom with shower, separate toilet, wooden terrace with garden furniture. Mobil-Home 4 rooms of 33m ² for 6 people, composed of a living room, a done up kitchen, a room with a double bed and two rooms with two simple beds each, a room of water with shower , separate WC and a terrace of 11m ². The Mobil-Home has three bedrooms with each blanket and pillows provided, a kitchen equipped and equipped with a fridge, a freezer, hotplates, a microwave, a coffee maker, a toaster, kitchen utensils and dishes for 6 people.